The Most Trusted Online Source for Your Medical Marijuana Card. 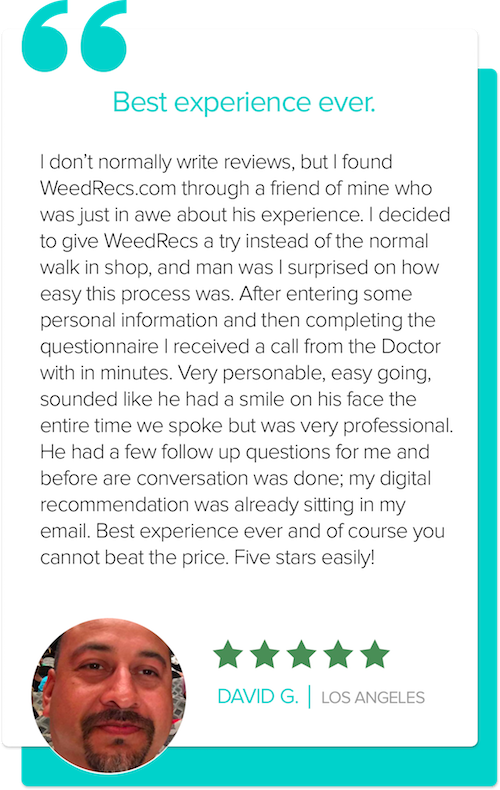 After completing your assessment and receiving your email with your digital recommendation attached, you may print it and walk into your local dispensary. Our SmartMatch™ technology will even help advise which form and strain will be best to try for your symptoms. We are a reliable group of doctors and technologists who are passionate about the highest quality patient care. We're laser-focused on healthcare and have nothing to do with growing or distribution. 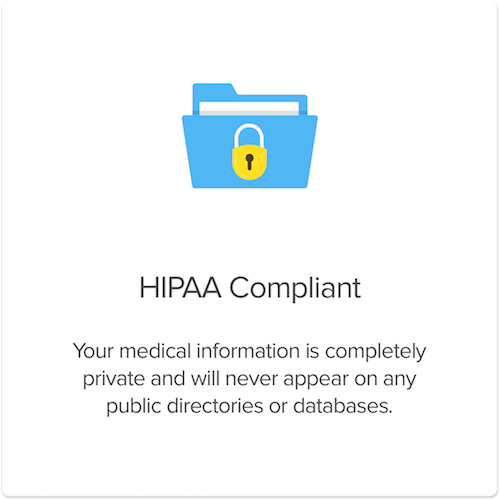 Unlike most online (or in-person) medical services that treat you like another number, we put your health first. Our technology saves you time and money without sacrificing the care and compassion you deserve. What our customers are saying about Weedrecs. Is there anything illegal about getting evaluated for medical cannabis? No, it is perfectly legal since all of our doctors are California licensed and in adherence with California telemedicine laws. You must be California resident 18 years of age or older, and have one of the qualifying health conditions approved for cannabis treatment in state of California. Proposition 215 was crafted with the intent of California residents to have easy access to medical marijuana recommendations. Can I get medical cannabis without a CA Drivers License or ID? To get your medical marijuana card, we need to be able to prove that you're over 18 years old, so an official state ID or drivers license (doesn't have to be California), passport or military ID is sufficient. Dispensaries and delivery services, however, can give cannabis only to a California resident. So if you don't have California ID, they may as that you provide proof of residency, which is as simple as showing a lease agreement or utility bill. Do I still really need a medical marijuana recommendation in California since its become legal? Even though California passed Proposition 64 in November of 2016, not all dispensaries are able to sell marijuana without seeing a doctor's recommendation. In fact, most dispensaries not only need to adhere to the local city laws around zoning and compliance, but will also enforce their own best practices. For example, some that are licensed to sell for recreational use will extend discounts for medical use, at their own discretion. What is a MMJ "recommendation" and how is that different than a "prescription"? Although great strides have been made in terms of the broadening acceptance of plant medicines, marijuana remains on the Federal government's list of schedule one drugs. Drugs on this schedule cannot technically be "prescribed". However, in accordance with California's Prop 215, a doctors "recommendation" may authorize a patient with qualifying conditions to purchase, consume, possess, and cultivate cannabis for their own consumption in the state of California. How does the Online Health Questionnaire (OHQ) work with the doctor's recommendation? Our doctors teamed up with technologists to build an assessment engine that combines process efficiencies with thoroughness in order to give you the most cost effective and complete care. Weedrec's patent pending Online Health Questionnaire (OHQ) is a thorough and dynamic assessment which changes based on the patient response, all the while becoming more customized and personalized to provide a unique and comprehensive clinical overview. One of our licensed doctors will then review you case which may, or may not require further consultation (conducted by telephone or video conference). In most cases, you will receive your medical marijuana recommendation the same day if submitted before 6PM.